Ruby (Smith) Mayden, of Carrollton, Missouri, passed away at 8:00 p.m., Saturday evening, November 17, 2018, at Cuba Manor Nursing Home in Cuba, Missouri. Ruby lived graciously and kindhearted, being granted an earthly life of 96 years, 10 months, and 3 days. A wondrous Saturday on January 14, 1922, in Bogard, Missouri, the Lord blessed the home of Carmel and Bessie B. (Jefferies) Smith with the arrival of twin daughters, Ruby and Ruth. Ruby was born first, with her arrival brought great joy to her awaiting family. Ruby attended school in Carrollton and graduated with the class of 1939, from Carrollton High School. She became acquainted with a young man and their friendship became evident and shortly after her nineteenth birthday she accepted his proposal of her hand in marriage and shared sacred vows with Harold Emmett Mayden on January 25, 1941, in Brunswick, Missouri. This union was richly blessed with two daughters, Judy Ellen, and Anna Mae. Harold sadly preceded her in death on November 23, 1995, giving Ruby 54 years of a lasting friendship and an abiding marriage. She relocated to New Mexico in 1962 before moving to Wichita, Kansas where she and Harold held employment at Beech Aircraft as assemblers. She moved back home to Carrollton in 1987 and became a caretaker and homemaker. She remained in her hometown of Carrollton until a recent illness and she decided she needed to be closer to her sister Melba in Cuba, Missouri. They both felt it was a blessing to have had this time together. Ruby had an illuminating smile and a soft embrace. She walked with grace and was kind and humble. She loved her two daughters and adored her grandchildren. Ruby was exceptional at preparing meals for her family, especially her turnip dish which has yet to be replicated by her written instructions and recipe. She enjoyed cross stitching and made many pieces throughout the years. Ruby absolutely loved her Kansas City Royals and was delighted to have seen them win two World Series Championships. Most of all, Ruby saw the beauty in every living creature and decided the ladybug to be one of the prettiest created. 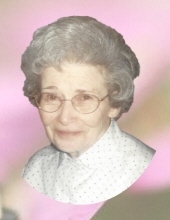 She treasured her church family and enjoyed the visits with her minister and her daily visits and routine with the many friends she had while living at Jefferson Park. She held an unwavering faith in her Lord and if she unable to attend church she would listen to the evangelists on television for a spiritual message. She was baptized and a lifelong member at the First Christian Church of Carrollton. Ruby loved and was loved by all and will be greatly missed. She is survived by two daughters, Judy Ellen Higley of Wichita, Kansas, and Anna Mae Kapusniak and her husband, Peter of St. Louis, Missouri; a sister, Melba Swope & her husband Chuck of Cuba, Missouri; five grandchildren, Matthew Kapusniak, Elaine Kapusniak, Jeffrey Kapusniak all of St. Louis, Sean Higley (Candy) of Wichita, and Timothy Higley of Colorado Springs; seven great-grandchildren, Tyler, Gavin, Brittany, Serena, Nathan, Bryan and Les. In addition to her parents, she was preceded in death by her husband, Harold Mayden; four sisters, Dorothy Keltner; Laverna Randall Vondora Helm and her twin sister, Ruth Kelly; two brothers Carmel Smith, Jr., and Garland Smith who died in infancy. Funeral Services will be held at 2:00 p.m., Saturday, November 24, 2018, at Foster Funeral Chapels, Carrollton, Missouri with Reverend Pat Jones officiating. A visitation for family and friends to gather will be held one hour prior to the services at the funeral chapel. After the services, we will leave in procession to Carroll Memory Gardens, Carrollton, Missouri where Ruby will be eternally and peacefully laid to rest next to her sweetheart, Harold. Pallbearers will be Jeffrey Kapusniak, Matthew Kapusniak. Sean Higley, Timothy Higley, Tyler Kapusniak and Gavin Kapusniak. As an expression of sympathy, Memorial Contributions in memory of Ruby have been suggested to help those battling cancer with the assistance of H.E.L.P. Services of Carroll County. To send flowers or a remembrance gift to the family of Ruby Mayden, please visit our Tribute Store. "Email Address" would like to share the life celebration of Ruby Mayden. Click on the "link" to go to share a favorite memory or leave a condolence message for the family.